At Olberding Dental, we are serious about creating and maintaining healthy smiles. 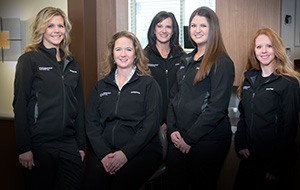 Our caring and skilled team values efficiency and brings a meticulous eye for detail to every step of your oral health journey. That’s part of what makes us different. We focus on doing everything right just for you. 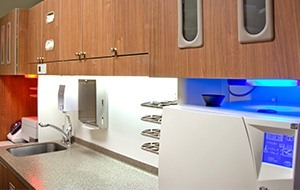 Your search for a Lincoln dentist offering a modern and inviting environment ends here! At Olberding Dental, we know first impressions are important. When stepping into our beautiful facility on Pine Lake Road, we want our patients to experience comfort and state-of-the-art care. We designed our modern practice to be functional and to provide our guests with an attractive and welcoming environment. 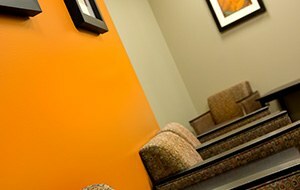 While hi-tech, streamlined, and pristine, our office is also comfortable, accessible, and beautiful. As an extra measure of comfort, we offer HD TVs in our waiting area and treatment rooms. Plus, pillows and blankets are always available to keep you warm and secure during any treatment you receive, be it a regular cleaning or a root canal. In the field of dentistry, technology continues to advance with each year. These advances translate to shorter, more efficient appointments and more comfortable treatment methods. Instead of relying on past experience, Dr. Olberding has continued to learn and always offers his patients the best treatment possible. He is a graduate of the acclaimed Misch Implant Institute and the celebrated Dawson Academy. He also continues to expand on his skills through the Spear Education program. Our patients can rest assured, if there is a treatment or technology that will benefit them, we are ready to put it in place. 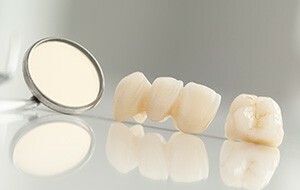 In the field of dentistry, technology continues to advance with each year. These advances translate to shorter, more efficient appointments and more comfortable treatment methods. Instead of relying on past experience, Dr. Olberding has continued to learn and always offers his patients the best care possible. He is a graduate of the acclaimed Misch Implant Institute and the celebrated Dawson Academy. He also continues to expand on his skills through the Spear Education program. Our patients can rest assured that if there is a treatment or technology that will benefit them, we are ready to put it in place. Here in Lincoln, we always want our patients to be truly wowed by the dental improvements we help them achieve. That’s why Dr. Olberding utilizes the most modern restorative and cosmetic materials available in the field today when providing services like dental crowns, porcelain veneers, and more. With this approach, you can expect your new smile additions to be seamlessly lifelike, naturally durable, and built to last for many, many years to come. Continuing education is a crucial part of quality dental care, as this field is constantly evolving. Dr. Olberding wants his patients to receive the best care he can possibly provide, which is why he’s attended countless courses and programs beyond dental school at some of the most prestigious institutions in the nation. Our team members also attend courses on a regular basis to keep their skills sharp, effective, and up-to-date. Utilizing the latest dental tools and techniques can lead to several valuable benefits for patients, including faster treatment times, added precision throughout treatment, and more overall comfort. 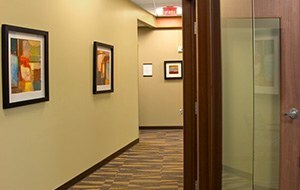 At Olberding Dental, staying right at the forefront of new developments is an important priority for our team. Digital X-rays, intraoral cameras, DIAGNOdent cavity detection, CB/CT Cone Beam, and more can be found here, and we know you’ll notice the positive difference they can make from the very first appointment. Dr. Olberding is proud to be surrounded by knowledgeable and dedicated team members who share his philosophy for top-tier dental care. From the front desk to the operatory, they will be helping you feel well-informed, comfortable, and right at home during every appointment. You will also see right away that we all genuinely get along really well! Through teamwork, we are proud to ensure the best outcomes possible for our valued patients. Do you want to schedule an appointment with our team? Call us today. Whether you’re looking for general, cosmetic, or restorative care, you can count on us to provide dental service that exceeds your expectations. 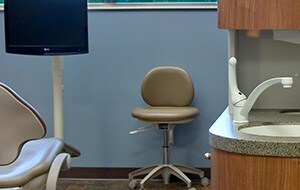 We will help you get to the root of your oral health problems so that you can enjoy better comfort and functionality.